Fr De Malleray sends news of a Vocations weekend organised by the Priestly Fraternity of St Peter in England. Please remember in your prayers the young men from England who are already considering applying to the seminaries of the Fraternity this year, and the priests who will be participating in the Fraternity's retreat in Bavaria. For any English-speaking Catholic men between 18 and 35 years of age (under 18 please contact us). Starts on Friday 26 April at 6pm – Mass 7.30pm (arrivals from 5pm) – ends on Sunday 28 April at 3pm. Led by Fr Armand de Malleray, FSSP, assisted by Fr Matthew Goddard, FSSP. Location: St John Fisher House, 17 Eastern Avenue, Reading, RG1 5RU, England. Off-street parking available. 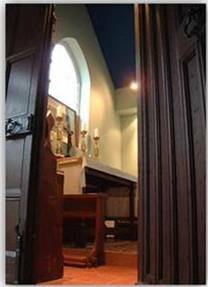 Programme: Spiritual conferences, socials, Holy Mass each of the three days (Extraordinary Form of the Roman rite) including polyphonic Sung Mass on Sunday, silent prayer, and optional private talk with Fr de Malleray, FSSP. Fr de Malleray will explain what a vocation is in general and to the priesthood in particular. Cost [for the whole weekend, 2 days + 2 nights, including full board accommodation at St John Fisher House]: no set price for students or unwaged – any donation welcome; others: £50 suggested. We are looking forward to welcoming you here. Please pray for our 8 seminarians from England.